I was rather excited when two weeks ago I received an email from Jamie Oliver’s Australian P.R. company asking if I’d like to be part of Jamie’s official Food Blogger Soup Challenge to coincide with his international Food Revolution Day campaign. The brief was to create a soup recipe that would get readers excited about cooking for themselves and therefore further spreading the word. Naturally I agreed to the request, I am after all a firm believer that everyone can learn to cook beautiful food. If you haven’t heard about it, Food Revolution Day this Friday May 17 aims to raise awareness for Jamie’s Foundations. Cooking, an essential life skill which used be passed down from generation to generation is in danger of becoming a lost art despite the proliferation of food blogs and cooking shows. In our present day this tradition has been overlooked by many who now lack even the most basic skills, turning instead to processed and take away meals for the sake of convenience. The ability to prepare food and follow a recipe can make a huge impact on people’s food choices and ultimately their health (as it did for me). Jamie’s Ministry of Food aims to empower people with the knowledge and confidence to cook from fresh ingredients, to make better choices about how they nourish themselves and their families. Jamie Oliver’s passion for good food and the relentless desire to spread the word through the Ministry of Food makes him the perfect ambassador for the mission. He was undoubtedly the first celebrity chef to inspire me to cook for myself and I found (and still find) his enthusiasm infectious. (His book The Naked Chef came out in 2000, the very same year I became interested in cooking.) I quickly cooked my way through most of it as well as the The Return Of The Naked Chef in 2001. Never before had I cooked curry from scratch or baked a whole fish and I was really eager to do so because Jamie made it fun. (Pete’s Lamb Curry from The Return Of The Naked Chef was the first curry I ever made and if you haven’t tried it you simply must, it’s a keeper.) A welcome bonus was that I could also find most of the ingredients at my local supermarket (thankfully, Jamie doesn’t expect an amateur cook to go on a mad search for sriracha or fiddlehead ferns at their local Woolies). In addition to the email from the P.R. agency I was very lucky to receive a lovely box of fresh produce from Aussie Farmers Direct from which I wrote this soup recipe. 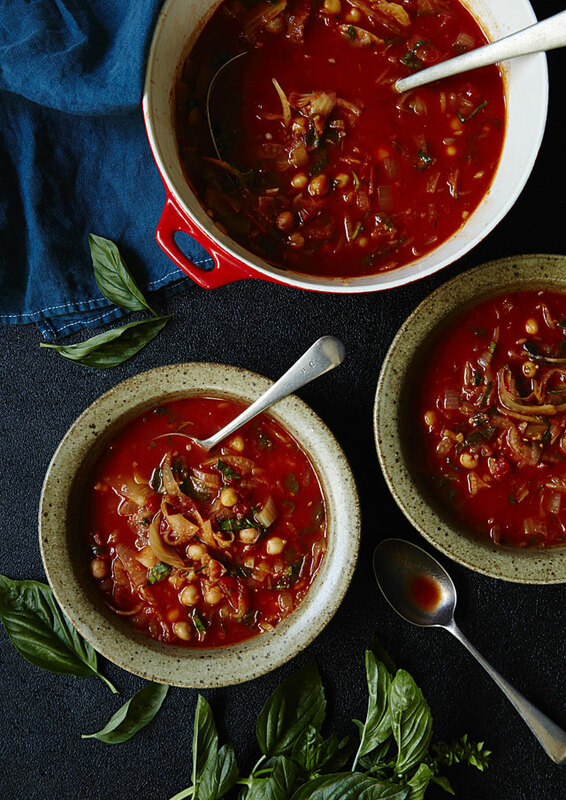 I paired thinly shaved fennel with tomatoes, chickpeas and basil with warming cumin and paprika to create this flavoursome and filling soup which is easy to prepare and tastes delicious. Fennel is a vegetable rarely explored by the amateur cook, and I encourage you to if you haven’t already. It’s beautiful in salads, roasted with butter and divine in this soup. The subtle anise flavour of the fennel matches that in the basil and the two sing in unison against the richness of the tomatoes. The beautiful thing about this soup is that you don’t need meat. Just a big deep bowl, a spoon and some crusty bread. I’ll be filling up a Thermos to take to the Love Real Food Picnic on Saturday the 18th at Sydney’s Centennial Park. I’ll be joining all the other picnickers with their home made food who too will be spreading Jamie Oliver’s word and joining in the fun. Hope to see you there, so let’s get cooking and vive la revolution! Spicy Tomato Soup with Fennel, Basil and Chickpeas. Serves 4-6. Prep 20 minutes, cooking time 45 minutes. 1. Place a heavy based pan over medium heat, add the olive oil and fry the onion until it is soft and translucent. Add the garlic and fennel and cook for approximately 20 minutes. The fennel will become soft and reduce significantly in size. 2. Add the tinned tomatoes, stir through and then add the stock, half the basil, the chickpeas, tomato paste, sweet paprika, thyme, cumin, chilli or cayenne pepper and salt. Bring to the boil, reduce heat then simmer for 20-30 minutes. This shoot was fun because the food was so vibrant. The gorgeous red enamelled cast iron pot is a vintage Copco piece and was salvaged out of a local council hard rubbish clean up. The stoneware bowls are English and were purchased at Vinnie’s. The vintage spoons and heavy French ladle came from a garage sale. Thank you to Megan Martin from Eurowalls who kindly provided the black wallpaper for the surface I photographed on. The only light used in this image is window light. What a gorgeous shot! And how exciting to be contacted by Jamie Oliver’s PR team for such a worthy cause. The soup looks wonderful. This is such a delicious looking soup. Great job with Jamie’s Soup Challenge, and love the photo! What a GORGEOUS shot, TRUE! Your recipe is so healthy too! Great job in supporting Jamie’s Revolution Day! I supported by making Rhubarb and Lentil Soup with Dukkah ..
Pingback: Food Revolution Day Rhubarb & Lentil Soup with Dukkah | What's On The List? Great to meet you yesterday and your blog is great. I couldn’t resist this recipe so I made it tonight for dinner. Very yum. Let me know when you head over my way again for more spices and we can chat more. I made this soup tonight, and it was lovely. I (mostly) doubled it and was very glad that I did. I minced extra garlic and poured olive oil over it, then drizzled that onto each serving for an extra layer of flavor. Even without that, I found the flavors in the soup to be seriously scrumptious. Thanks for posting the recipe! 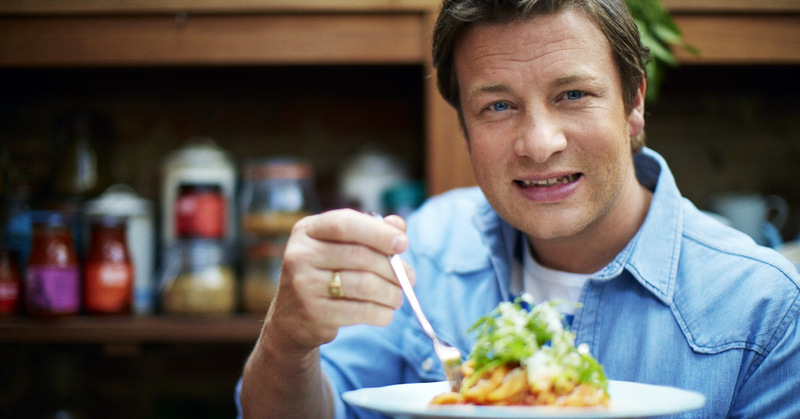 I absolutely love Jamie Oliver. Last year I made a soup hater request his 30′ Dinner fish chowder and spicy prawns repeatedly throughout the year! I also loved his reality show about his Food Revolution. On easy uses of fennel: when we were living in Europe, I loved adding it to a cucumber yogurt salad in very, very thin slices with garlic, salt, and pepper. Super easy, and a nice way to ease into the anise seed flavor that some people don’t like.